You are currently browsing the tag archive for the ‘steve beshear’ tag. “Need vs. Notoriety” is the conflict at the center of Cheri Lawson’s NPR piece on the Ark Encounter theme park proposed for northern Kentucky. The story covers Governor Steve Beshear’s defense of the park (which represents a literal interpretation of the story of Genesis) on financial grounds and the ridicule the project has received. It goes further, too, talking with scientists and scholars about science education and the Constitution. Attorney General Jack Conway is the latest Kentucky official to ask Florida Governor Rick Scott not to cut a not-yet-implemented prescription pill tracking system. The bottom line is that we need to stop illicit prescription pills at their source; states like Florida and Georgia that do not have prescription drug monitoring programs in place. Programs like Kentucky’s KASPER system are needed, warranted and must be implemented in all 50 states. Until that happens, prescription drug abuse will continue to ravage our families and our kids. It’s been one week since a group of protesters ended their sit-in at Governor Steve Beshear’s office. A group of 14 protesters spent the weekend in Beshear’s office protesting the surface mining technique commonly called Mountaintop Removal. The sit-in ended with the annual I Love Mountains Day rally in Frankfort on the 14th. Kentucky author Silas House was among the 14. An essay about the experience and mountaintop removal was published in Saturday’s New York Times. The news media and the rest of the country typically think of mountaintop removal as an environmental problem. But it’s a human crisis as well, scraping away not just coal but also the freedoms of Appalachian residents, people who have always been told they are of less value than the resources they live above. A few days after the rally, the U.S. House of Representatives voted on a spending bill that weakens the federal government’s ability to regulate mountaintop removal, though the bill may not pass the Senate. The House debate over EPA spending overlapped with the state Senate’s Natural Resource and Energy Committee vote to declare Kentucky a “sanctuary state” that’s exempt from EPA regulation. That legislation also faces an uncertain future. Fourteen protesters will be spending the weekend in the office of Kentucky Governor Steve Beshear. They belong to an environmental group called Kentucky Rising that gathered in the governor’s office this morning to demand a meeting with the governor. Beshear met with the demonstrators, who voiced their objection to mountaintop removal mining and their concerns about the environmental damaged caused by coal mining in eastern Kentucky. In his State of the Commonwealth speech last week, Beshear called for the EPA to get off the backs of the state and the coal industry. One of the protesters, Jason Howard, objected to that. “It’s not the EPA and the federal government that needs to get off your back. It’s the coal industry and your administration that needs to get off our backs,” said Howard. Author Wendell Berry is one of a group of protesters staging a sit-in in the office of Governor Beshear at this hour. The group is demanding a meeting with the governor to discuss ending the practice of mountaintop removal mining and creating a new economic model for Kentucky. The group of twenty calls itself Kentucky Rising and says Beshear has refused previous meeting requests. They say they plan to stay in the governor’s office until he meets with them or orders them removed from the building. In addition to Berry, the protest group includes Kentucky authors Silas House and Erik Reece as well as activists and retired coal miners. Beshear’s office tells WFPL the governor is willing to meet the group, but will not have time today. Demonstrator Jason Howard is tweeting from the sit-in. Changes could be made to the Ohio River Bridges Project. Governor Steve Beshear of Kentucky, Governor Mitch Daniels of Indiana and Louisville Mayor Greg Fischer are touting a proposed set of changes to the project. The changes would shrink the ORBP, but two new bridges and a revamped Spaghetti Junction would still be in the plan. The leaders have proposed keeping Spaghetti Junction in its current location, making the east end bridge four lanes instead of six and cutting bike lanes from the proposed downtown bridge in favor of the pedestrian-only Big Four Bridge. The proposed changes could cut half a billion dollars from the project. Both states and the bi-state Bridges Authority will host a conference next month to find other ways to cut costs. Mayor Fischer says that may satisfy those citizens who have said the $4.1 billion project is too expensive. Fischer also says tolls should not be placed on the Sherman Minton or Clark Memorial Bridges. The group Say No To Bridge Tolls has called the proposed changes a victory. Members further hope no tolls will be placed on the Kennedy Bridge and that the project will be built in phases. The Bridges Authority previously opposed that suggestion. 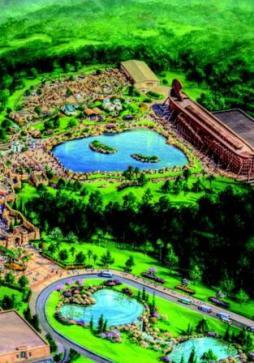 Georgetown College professor Dr. Robert Bevins has sent a letter to Governor Steve Beshear regarding the planned Ark Encounter creationist theme park and the state tax incentives Beshear says the park will receive. It was with great sadness that I learned of the severe injury done to the Commonwealth of Kentucky’s reputation. It is a sad day when Kansans can look down on Kentucky, that at least Kansas is not trying to attract an amusement park catering to the unscientific concept of young earth creationism. Worse still, Kentucky is offering tax incentives to attract further development by Answers in Genesis, a group that can only further decrease our reputation as a state that values higher learning. It wouldn’t be a slap in the face to all of my fellow alumni of the University of Kentucky, devaluing the doctoral diploma that I proudly display in my office and denigrating the verifiable and evidence based science taught in our land grant universities and private colleges if Kentucky wasn’t looking to help fund an ethically bankrupt amusement park. The presence of the Creation “Museum” is embarrassment enough, but to know that my tax dollars may help to fund its expansion, when researchers at UK and University of Louisville face tight budgets while performing ground breaking scientific research, it is simply too much. Ignorance is bliss to Ken Ham and Answers in Genesis, ignorance and fear of a wrathful and genocidal god. I wonder, shall the amusement park include a wave pool filled with the simulated bobbing bodies of the dead, as the Museum cheerfully displays the Genesis account of the Great Flood via computer animation and artistic dioramas of the wholesale slaughter of the world?Having been to this “Museum”, I can say that no depth is too low to subject young minds to in order to scare them away from inquiry and learning. What shall I expect next from the government of our fair Commonwealth? Should UK and the University of Louisville begin to offer degrees in astrology? Will the UK medical school offer coursework in homeopathy? Perhaps you could establish a Department of Divination to direct the government’s future goals and to offer you a morning horoscope? Or should I expect some other discipline of magical thinking to be given the stamp of approval of the state? Why did you choose to encourage what can only harm our state’s reputation? Was it a promise of 30 pieces of silver (a temporary increase in construction jobs) to betray our good name?